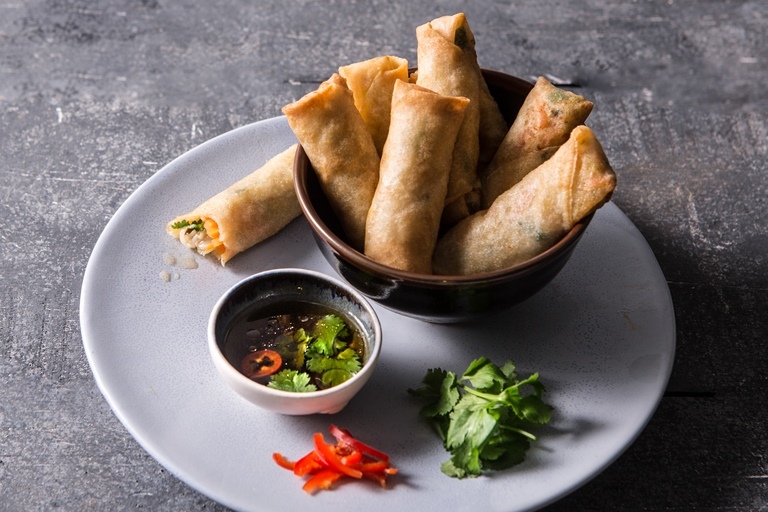 Spring rolls are traditionally eaten during the spring festival in China, hence the name. Believed to bring wealth and prosperity in the new year (because the roll is the shape and colour of a gold bar) spring rolls are a tasty, easy snack to prepare for Chinese New Year or as part of a buffet at a party. Some recipes call for minced pork or chicken, but I prefer them simply made with mixed vegetables and glass, or vermicelli, noodles. Spring roll pastry can be a little tricky to get hold of but Asian supermarkets will definitely sell it, it comes in varying sizes – the wrappers I used were about 10cm square. Any smaller than this and it will get a bit fiddly to seal the filling properly, so don't be tempted to use wonton wrappers. You can of course alter the vegetables in the filling to your personal taste, red pepper, celery and green beans will all work well. Served with a simple rice wine vinegar and sesame oil dipping sauce, these crispy treats are practically irresistible.